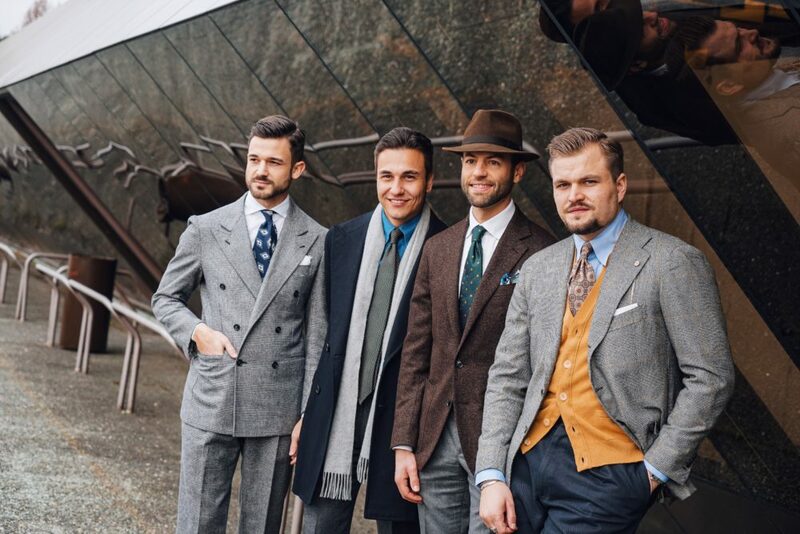 If I learned one thing in my career as serial quality and style connoisseur, there is nothing more interesting than a woman or man who is absolutely her or himself. The fashion industry is one of the most superficial out there and it is hard to come across authentic people, trust me, I know! This being said, I have always dressed similar to what I would wear at home. Of course you want to look sophisticated and throw on a tie and maybe polish your shoes (maybe), but that is absolutely normal. I for one, really like wearing a tie and if it is bold, then I adjust the outfit accordingly. For the first day, I chose my main center piece to evolve around the cardigan (Drake’s) as you can no doubt see. The beauty of the color is that it is really classic in a sense but also very bold. 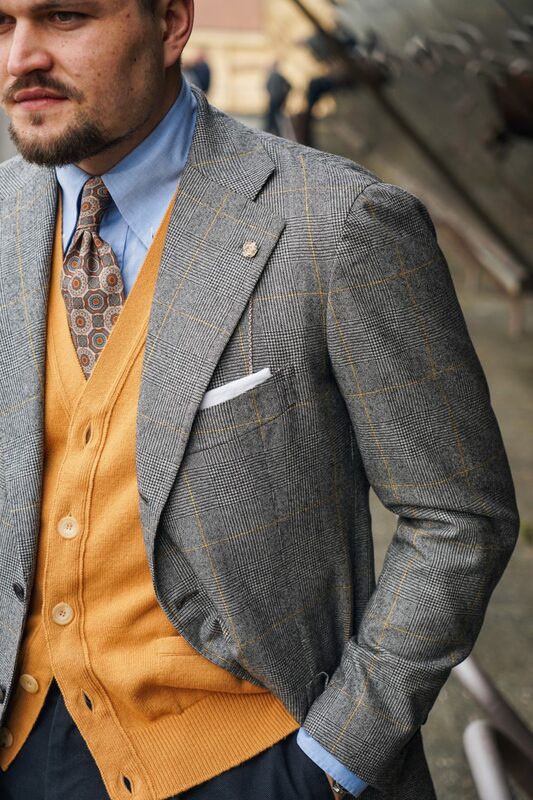 The POW jacket (Massura) with the yellow check from fabric giant Vitale Barberis Canonico adds a nice bit of charm as well. 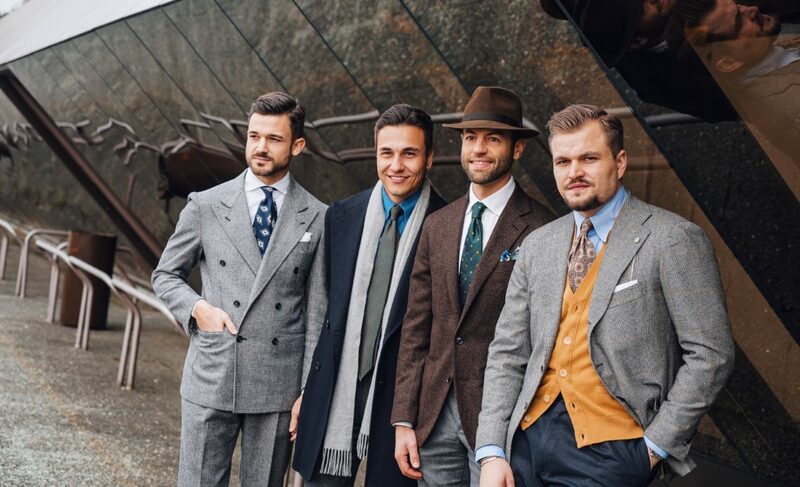 Usually, I’m not a fan of grey on blue combinations as we are used to do it the other way around. However, in order to keep the focus on the top, I went for a clean look on the bottom. 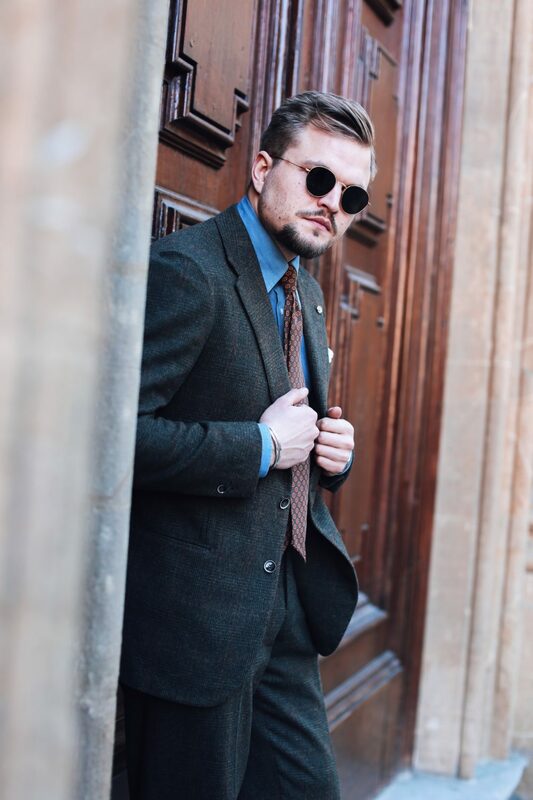 The Oxford chambray shirt by Camessi gives quiet a bit of support to the neutral ground of the trousers and is rather casual in style. The combination is loud but still something I find, can be worn on a daily basis given the chance. 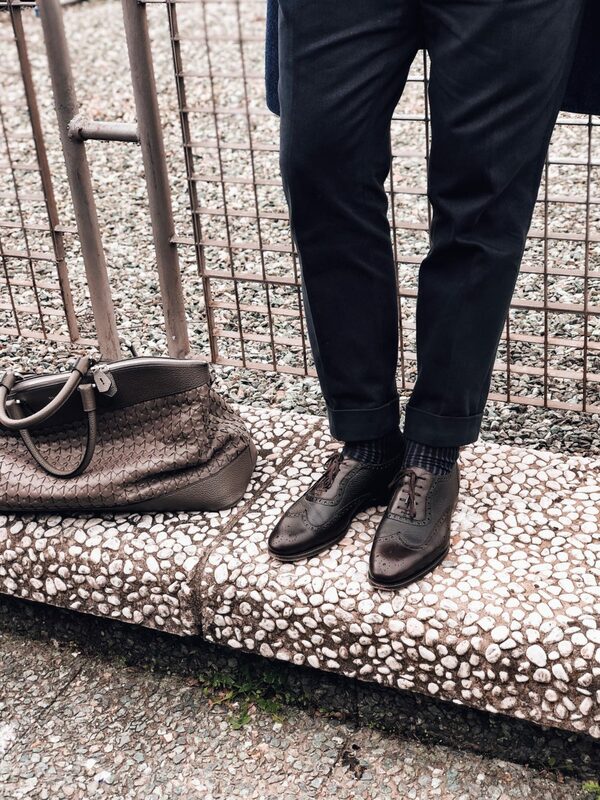 The shoes are a reinterpreted Brogue by Italian creative brand Barbanera with a two different fabric complimenting the silhouette called the Spirelli. Overall, a look to remember. People always say that the second day is the most important as most people arrive on the first day and therefore the second is more packed. Quiet obvious if you think about it… For the second day I chose to go with my new Donegal Tweed Jacket (Massura). A beautiful piece of craftsmanship showing off the typical donegal tweed structure of multiple colored yarns underneath the main color which is green. To accompany the jacket I went for a fully handmade shirt (Camessi) in light blue poplin and grey flannel trousers. 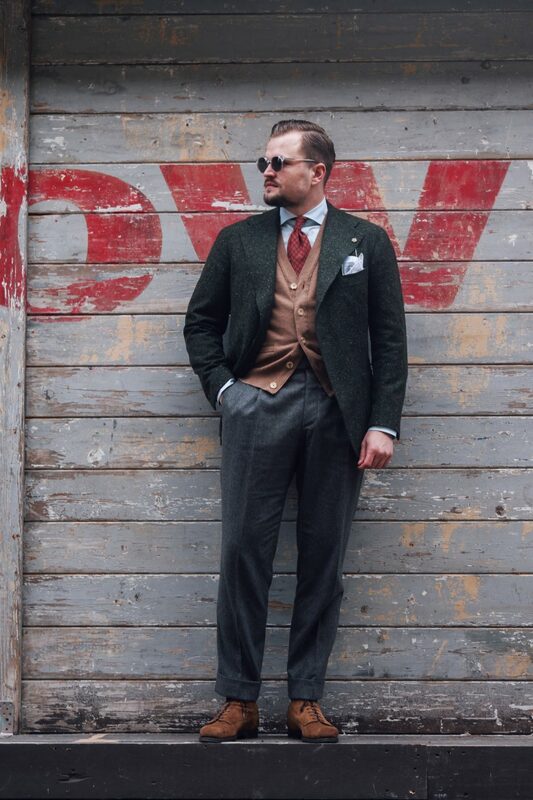 The overall look was a combination of earth tones and classic menswear favorites. 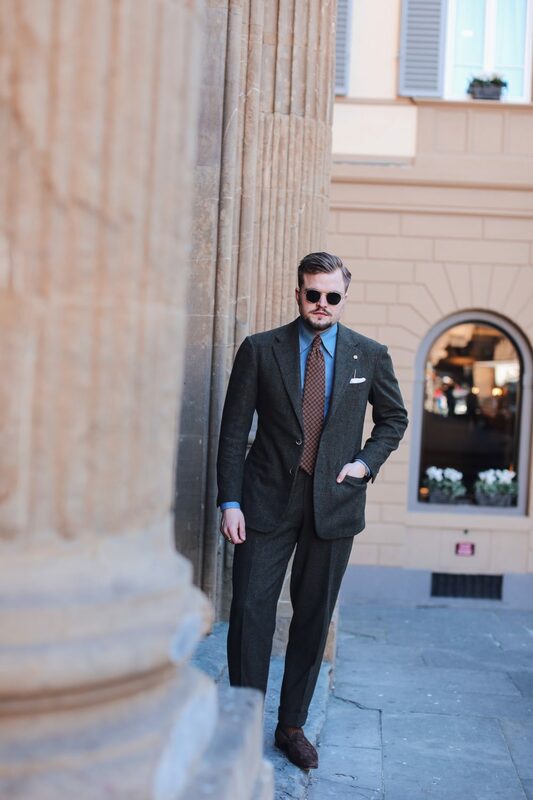 In order to pop some color into outfit, a patterned red 5 fold tie (Gentlemanclover) did the overall trick. The shoes are another pair by Barbanera, the Kerouac. Day 3 of the fair was rather calm and most buyers and press are already heading back home or onwards to Milan Fashion Week. As most stand visits were done the previous days, this allowed us to roam around the city and see beautiful Florence on a glorious sunny day. 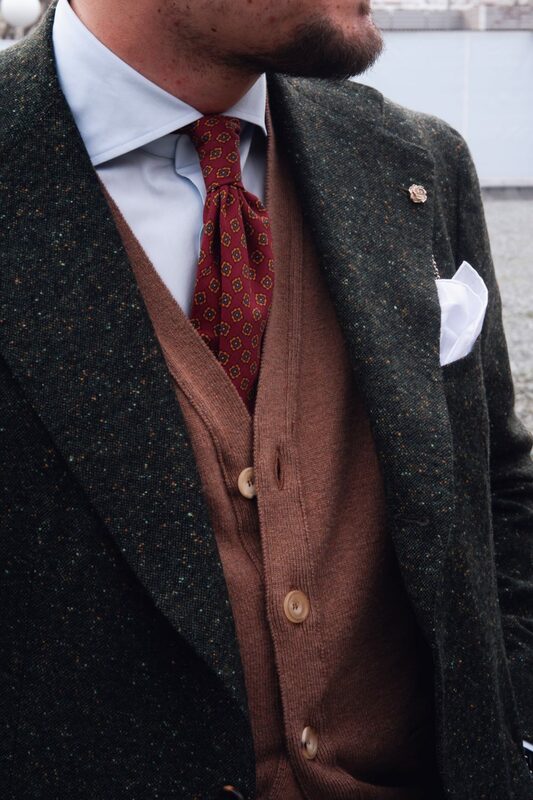 I wanted to wear a suit to the fair and so chose to bring out an old favorite this winter. The POW scotch flannel with its orange check made for a nice last day around the fair and the city. 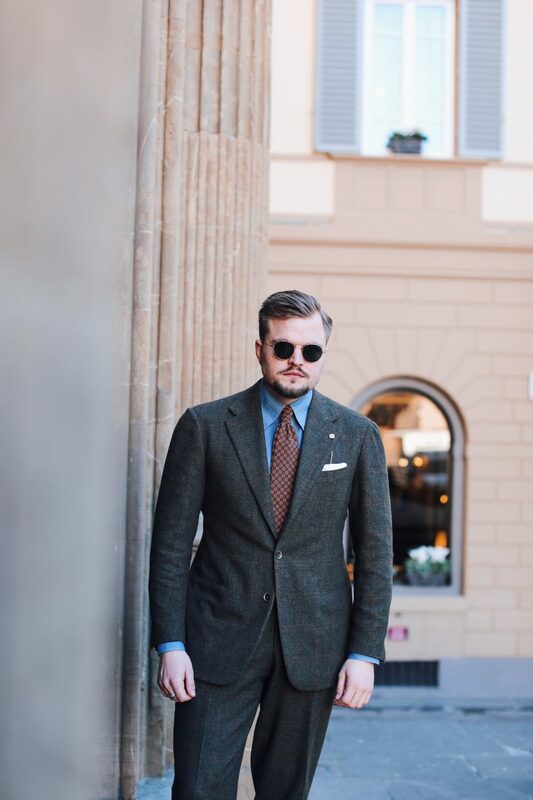 Since you do automatically dress up for Pitti, another tie was opted for, this time pairing it over a a denim shirt with a rollin button down collar. I am a strong believer that a denim shirt is a must-have item and should be in every mans wardrobe and it does not hurt to have a few different version of it. Looking at my feet, you guessed it, another pair of Barbanera Shoes, this time a Loafer, the Gottuso. 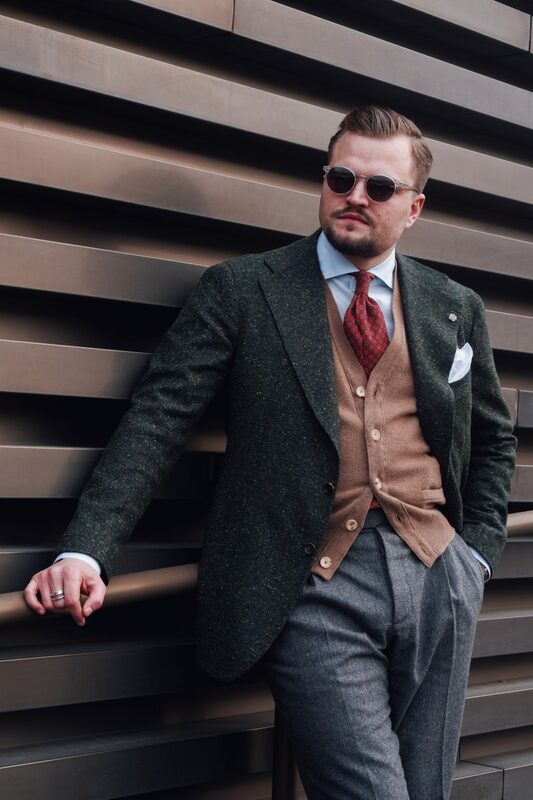 So now you have seen what I have worn and how this Pitti Uomo turned out for me. The fair is something everyone should experience if they are interested in that field. For me, the event is an opportunity to expand my network, talk to people you haven’t seen for a while and most importantly, look for brands that can be represented in your product portfolio. At first it comes across as a circus with all the crazy dressed people walking around in the yard pretending to call momy for the 100th time. However, after a second glance, it is a trade fair, an exhibition where the newest trends are being represented and orders are written. Through all the junk walking around, you sometimes get to spot some real talents in the dressing world. Let me know what you think and if you need any further information about the trade fair or outfit suggestions and ideas.